Yet Another Sunset, Tired of Those? It’s been too long. New jobs, new commitments, none of which mean anything to the average reader of this blog. It’s not original is it? Sunsets get plenty of love. People go out to beaches or mountains to see them. They throw them in movies for style to add a sense of romantic danger or paradoxically a romantic calm. And yet how could I not post this? The simple motion of the earth around the sun feels like the absurd grinding of fate. More days gone from life. And yet how could I not post this? It’s a parking lot, not even a tourist attraction. A boring office parking lot. And yet, how could I not post this? Heaven as firey as Hell. Sky as diverse in color as the world, full of blues grays, yellow, orange, colors that go together, colors that clash. Blood, flame, blackness, lightness, peach banana pudding. It’s easy to forget these were storm clouds which pounded rain and shot lightning just seconds before the photograph. What does it all mean? Or should it even mean anything? Truth is not beauty. Truth is not ugliness. Truth is every color thrown at the eye in a blinding glare. When the sun heads down, the truth is more comprehensible. But only slightly. 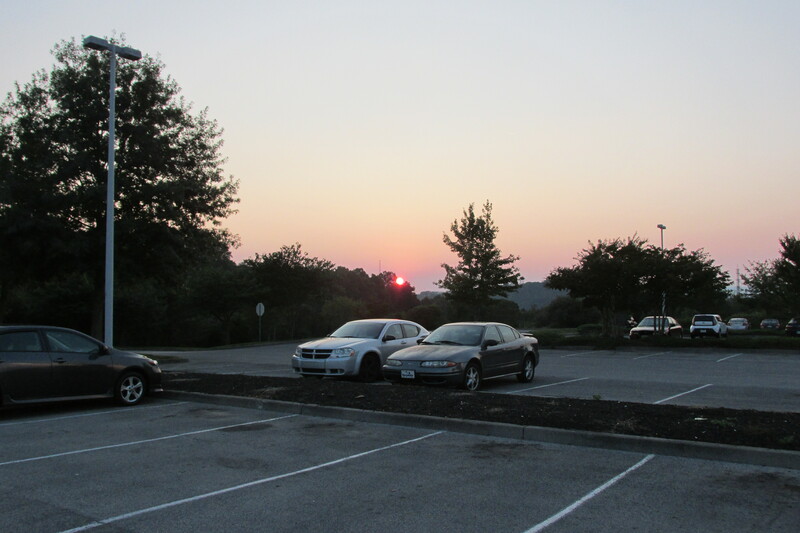 Unadmired Beautiful Parking Lot Views from Oak Ridge, Tennessee. It’s a construction site and an adjacent office parking lot. It’s on aptly-named Commerce Park Drive in Oak Ridge, Tennessee. Nobody goes there to look at scenery. I go there to pick up my girlfriend from work. Yet somehow, that hill’s view of the Cumberland Plateau over ridges, uninvited wildlife and exposed red clay mini-mesas leave me running around with my camera as though it’s the Grand Canyon. It’s a spot too big to be a mandala like the one that David George Haskell described in The Forest Unseen, and perhaps it’s most defining feature is the view of the world beyond it. Yet it intrigues me. I’ll be returning there on this blog many times throughout the year.